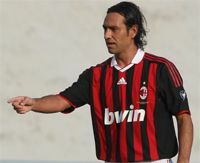 Milan Defender Alessandro Nesta: It’s Nice To Be Back - 20 July 2009 - . :Alessandro Nesta:. how do you think this site need a forum? The 33-year-old centre-back is ready to put his injury nightmare behind him. Alessandro Nesta was pleased to pass unscathed through Milan’s friendly match with the Los Angeles Galaxy, and can finally see the light at the end of his injury tunnel. The former Lazio man was a mere spectator last season and only made a brief cameo in a friendly against Tirana in October, struggling with chronic back problems before eventually going under the knife in February. “I am happy because I feel good,” Nesta told the Rossoneri’s official website after playing 45 minutes against David Beckham’s side. Milan drew 2-2 with the Galaxy, with the hosts' Alan Gordon and Bryan Jordan cancelling out Milan's Thiago Silva and Filippo Inzaghi strikes. “The Galaxy have proved to be a good team, regardless of what is said about them,” said Nesta.